Abstract: It's nice to see that manufacturers are quickly adopting the SiS 648 chipset as an alternative to Intel's i845D/E/G DDR chipsets. 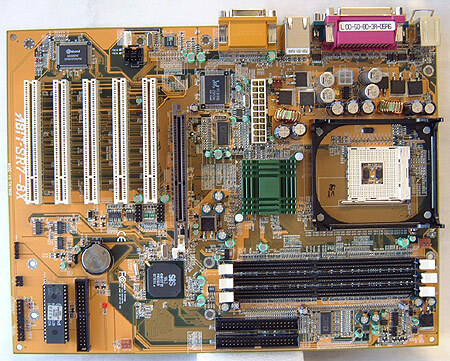 Looking at the package of the Abit SR7-8X, we see that the motherboard is actually a no frills board which retails for a mere $150 CDN ($100 US). So what do you get with the mobo? In terms of features the motherboard is a bit sparse, it only sports onboard 10/100 LAN, 5.1 audio, five PCI slots, a 8x AGP compatible slot and three DIMM's. At the moment only the SiS Xabre 400 and ATi Radeon 9700 support 8XAGP, and the performance gains are minor as no game has really been coded to take advantage of it yet. The DIMMS will support PC1600/2100 up to 3GB and 2700 up to 2GB. You can also use PC3200 modules, but the support is not yet official. The SiS963 southbridge does have native support for USB 2.0 and Ultra/133 RAID as well. As we can see, the Abit SR7-8X doesn't exactly light up the room with a flashy PCB, or hordes of extra adaptors. Actually the board looks pretty plain, but as long as the SR7-8X can deliver in terms of performance what else is really as important? The layout of the board is pretty good, the IDE drive connectors are in the perfect location to the right of the DIMM slots - this way the cables don't block the case airflow or interfere with the PCI expansion cards. Something I'm greatful for is there are no small capacitors near the AGP lock! Little things like that sure do make life a little bit easier when installing videocards! The three fan headers and Clear CMOS jumper is very easily accessible, not hidden away behind a PCI slot or IDE ribbon cable. It was good to see that even thought Abit used a standard green heatsink on the SiS 648 Northbridge, they also took the time to apply some thermal paste on it. Since the 648 does generate quite a bit of heat under full load, it's reassuring that Abit is trying to do the little things right. To be honest we're a bit surprised by the lack of features not included on the Abit SR7-8X. Most motherboards in its class are abounding with USB2.0 jacks, IDE RAID, Serial ATA, and even Bluetooth. Perhaps Abit is testing the waters with the SiS 648 chipset and 8X AGP first before all the other goodies are added. The plus side of course is that the lack of added-value features leaves the cost of the motherboard very nicely low. 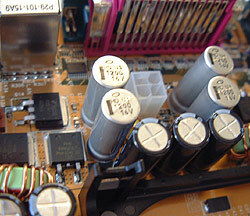 Most users tend to buy what they need and install as they go into one of the five open PCI slots. A 10/100 Ethernet connection is included on the board just above the two rear USB ports. As this makes the IO configuration non-standard, Abit have included an IO plate so you can replace the one in the case.